Ariana Grande has shared the effect post-traumatic stress disorder (PTSD) has had on her brain. The photos show a comparison between a “healthy brain” and “PTSD brain". 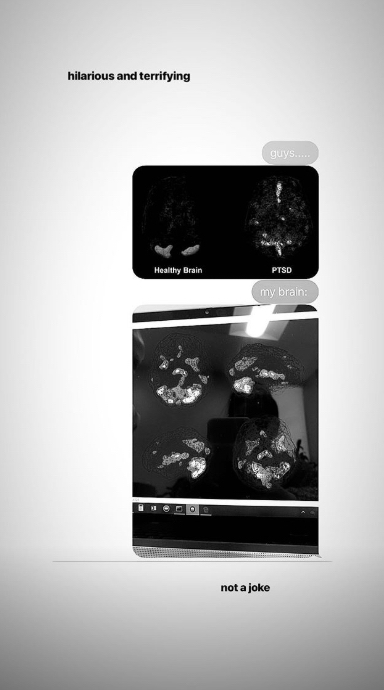 “guys….,” she texts her group, adding, “my brain.” As well as, "hilarious and terrifying". Ariana previously opened up to British Vogue about the disorder saying, "I hate…yeah…admitting it but it very much is." According to Mayo Clinic, post-traumatic stress disorder symptoms can be so severe as to interfere with your ability to go about your normal daily tasks. These symptoms include, intrusive memories, avoidance, negative changes in thinking and mood, and changes in physical and emotional reactions. If you are someone who you know is struggling with PTSD or associated disorders, help is available.